GSEB Head Teacher Aptitude Test (HTAT) Recruitment 2017 :Gujarat State Education Board is the board for primary and upper primary education in the government of Gujarat. Every year it releases notification for the recruitment of teachers in those schools. Now, it invites applications fo 1000 vacancies from HTAT qualified candidates for the post of Head teacher. 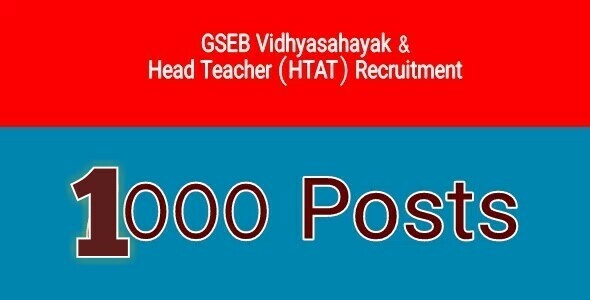 Educational Qualification for GSEB HTAT Recruitment 2017 :http://www.vidyasahayakgujarat.org/. Candidates should be Graduate Degree / Bachelor Degree with Diploma in Elementary Education / Bachelor of Education. Based on HTAT Exam Merit List .